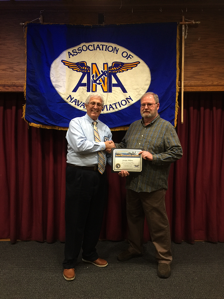 On Apr 12, 2018, the Grampaw Pettibone Squadron was honored to have as its guest speaker, Mr. Doug Milliken. Mr. Milliken, a retired automotive engineer, provided the audience with an overview of his experience, as a member of the 4th Infantry Reconnaissance Platoon, in remote locations in the Central Highlands of Vietnam in 1970. Our speaker was a participant in Operation Binh Tay I, the largest U.S. helicopter combat assault of the Vietnam War, in an attack against enemy forces staged on the Ho Chi Minh Trail in Cambodia. He was the recipient of the Bronze Star (V) Medal, the Purple Heart, the Air Medal, and the Vietnam Gallantry Cross. 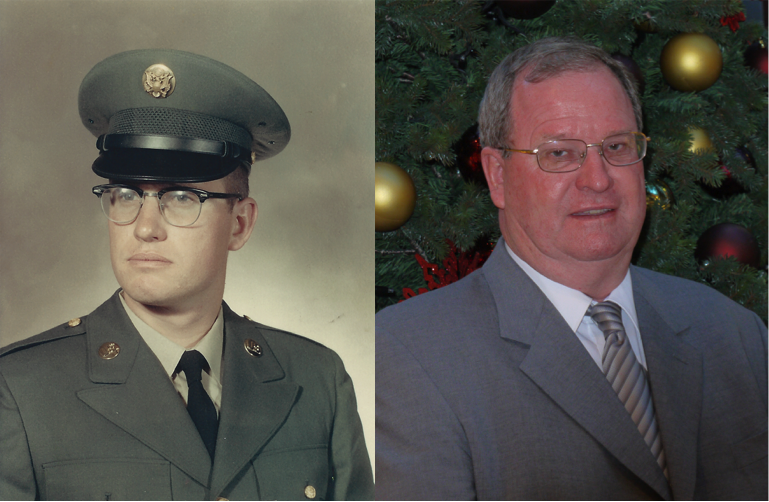 Mr. Milliken began by describing the organizational structure of the Army recon unit he belonged to and the difference between his unit and special volunteer recon type units in the Army and other branches of the military. 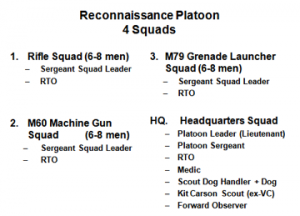 The 4thInfantry Reconnaissance Platoon is a 30-man organization comprised of three working rifle squads and a headquarters squad, each with a specific duty. Normal assignments could be; recon, support or reactionary force protection or occasional use to setup an ambush for expected enemy activity. The structure for the Binh Tay I operation included additional weapons assignments, resulting in the existing squads updated and in addition to the standard rifle squad and headquarters. 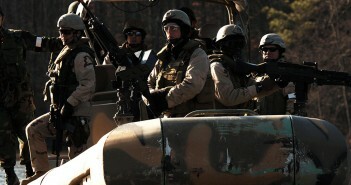 The remaining squads will include; a machine-gun squad and grenade launcher unit, each with 6-8 men. The headquarters unit included a scout dog and handler. The dog was trained to detect the scent of enemy activity in a patrol area as old as 48 hours. This would alert the patrol to check for additional evidence and prepare for subsequent action as needed. An additional member of the headquarters staff was a former enemy soldier who became a reliable and trusted source in identifying enemy activity. This individual aided in the Binh Tay I operation in the capture of enemy combatants. Members of the platoon were equipped with the M-16, a rifle that had experienced earlier reliability issues, which were corrected by the time of this operation. The machine gun squad was equipped with the M-60 machine gun, which fired a 7.62mm round. The grenade launcher was a hand-held model M-79. The grenadier carried upwards of two dozen grenades to be fired from the shotgun looking launcher. Because it required at least 30 meters in flight for a round once fired to arm, it was not useful in close combat. Our speaker was the M-60 operator on this operation. Members of the platoon would carry up to 200 rounds each of ammunition linked together. This would be given to the machine gunner’s assistant, who would link the additional ammunition to the current link of rounds being fed to the machine gunner in providing a continuous rate of fire should circumstances require such action. In describing the terrain, our speaker indicated that about 90% of patrol activity was in very dense, triple canopy, jungle with less than 10% in open terrain. Because of the type of terrain encountered, it was critical for all personnel to learn navigation techniques, contour map and compass reading, which was taught during earlier training. Understanding navigation, as well as map reading, was important for relaying coordinates for artillery support or to request airborne weapons support or for extraction. When describing techniques for unit protection at night, the ‘Night Defensive Perimeter’ was explained. A 60-foot diameter circle is created with a rifleman from each of the 3 squads spaced 10 feet apart to create the outer circle. The headquarters squad would be located inside the circle. 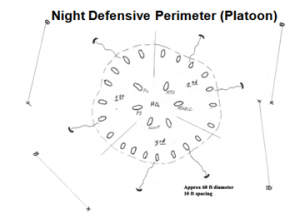 Additional protection was created by placing claymore mines, an explosive device that contains 700 steel ball bearings with a range of 50 meters and placed to spray at an angle of 60% from its placement. This would be activated electrically against an attacking unit in a concentrated fashion to defend the platoon. Additionally, a series of tripwires, further out, were connected to flares or grenades, which would be activated by enemy personnel if they disturbed the wire when moving towards the platoon. The platoon spent up to 90% of their time in a month on patrol. When on patrol, each member carried up to 75 pounds of equipment and supplies, which included: 12 meals, over 400 rounds of rifle ammunition, water, grenades, explosives, claymore mine, foul weather gear, rifle cleaning kit and gas mask. Optional equipment may be needed as operations required. This added to the weight carried by each member of the platoon. The technique used in defending the unit called for firing tracer ammunition. Tracer ammunition will reveal the location of the unit firing their weapons and is normally not the preferred method of responding to enemy fire. However, it was considered a technique to convey to the enemy the presence of a much larger force and result in an enemy withdrawal. The C-4 explosive carried by the unit was often times used to remove trees in order to create a clearing and assist helicopter landing activity for resupply, medevac or personnel movement. It was also used to destroy enemy equipment, supplies or shelters. The newer designed hand grenade issued was shaped like a baseball. It was considered easier to throw compared to the earlier pineapple shaped grenade. After describing general unit activity, our speaker outlined Operation Binh Tay I. This operation, which occurred in May 1970, began in the south of the country and represented the largest helicopter combat assault during Vietnam. This was due to the location and terrain, which made it time-consuming to march to the location. Six battalions, containing 500 troops in each for a total of 3000 personnel, were flown by 120 helicopters over a 3 day period to the mission location in Cambodia. Cambodia leadership previously was not supportive of the US. With new leadership, friendly to the US and supportive of activity to remove the enemy, May 1970 was considered a suitable time to move against the enemy. When the press reported this new event, protests increased and the well-known Kent State shooting occurred in the US. Movement of personnel to the target location encountered significant enemy ground fire. Attempts to find suitable landing spots that were considered safe resulted in a clearing being spotted. One helicopter landed and the enemy held fire while troops discharged. A second helicopter landed and as the first troop stepped off, enemy ground fire forced one aircraft to remain on the ground and the second aircraft was brought down and crashed leaving 12 troops on the ground and surrounded by a larger enemy force. A decision was made to use gunships to suppress enemy fire while other aircraft landed. Limited personnel were able to land, but wounded and killed numbers increased. Eventually a large enough force was brought in and patrols were created to search out for enemy movement. Some prisoners were taken and later questions were answered regarding enemy location. The final numbers from the operation in the north, US-46 killed, 118 wounded and NVA-212 killed, unknown wounded and 7 POWs taken. At the conclusion, a few questions were asked. One question was asked about status of the enemy guide since the war ended. Our speaker did not know his location. When asked what the most common question came from grade schoolers, the response was, what did you do on weekends? Maps were accurate surprisingly. Our speaker was wounded, but after a recovery did return to his unit. Close air support was not normally called on since they were a recon platoon. The primary job was to find evidence of enemy activity and then report it to senior command.